I recently discovered a super cool product: Pebeo Porcelaine 150 Paint Pens. I found mine at Michael’s (after checking Hobby Lobby) for $3.99 each. I decided to make a mug set for bridal shower gifts, so I picked up four plain white mugs at Target for $2.99 each. I made a design template in Photoshop, printed to plain paper and cut out my design. Then, I carefully outlined my design and filled it in. The Mr. and Mrs. mugs were a hit at the bridal shower! 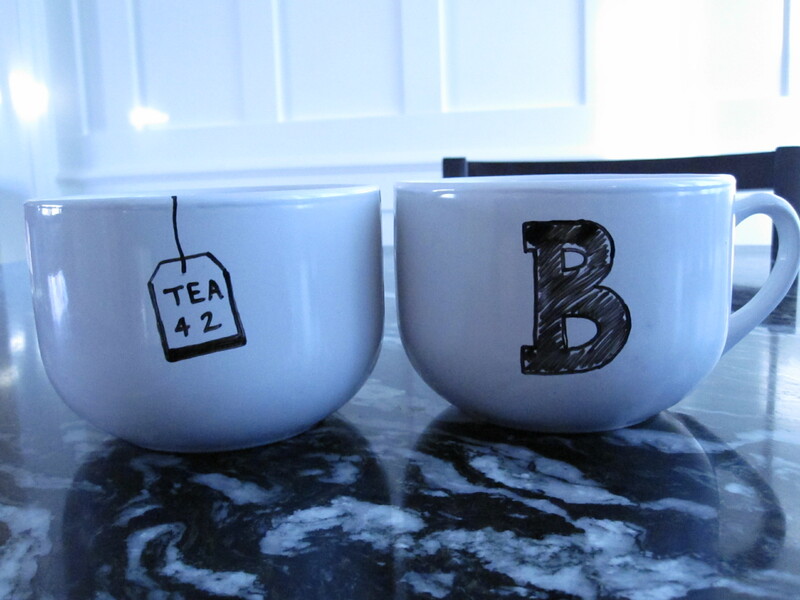 When I found some free time, I decided to paint two mugs I already had. 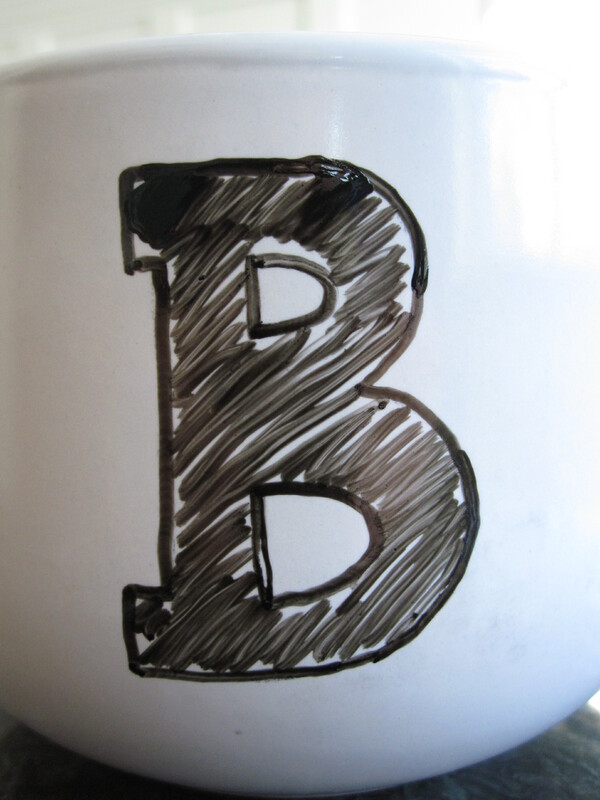 (Sorry for the blue-ish tint) The B is a sketched fill, inspired by a set Design Mom featured. 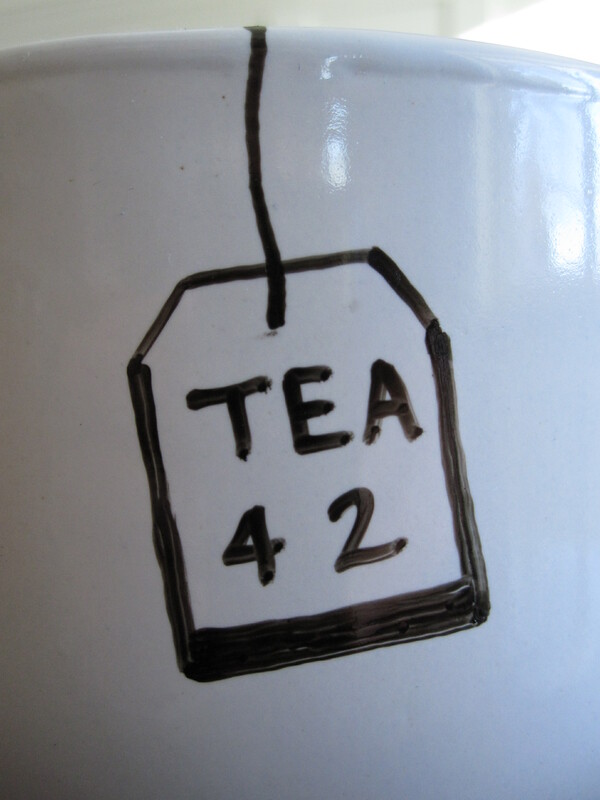 Even though I don’t drink tea, I seem to be drawn toward tea items, so this was perfect for our tea drinking guests. These mugs are huge, (seriously, our tiny coffee pot fills one cup) so I decided to play off that. 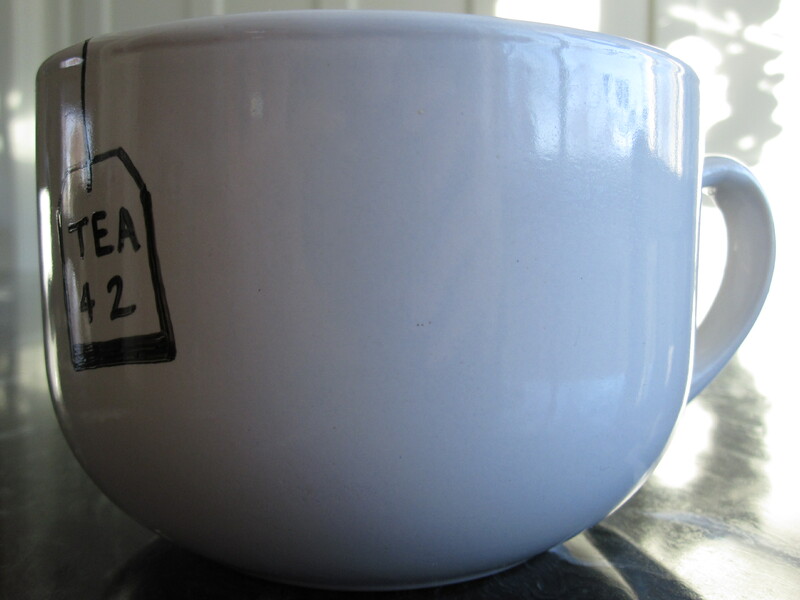 The mug is large enough for tea for two. Now our guests will have cute, custom designed mugs to use. As I said, we created Mr. and Mrs. mugs as a bridal shower gift. What are your favorite hostess, bridal shower or wedding gifts? Have you used the porcelain paint pens or glass pens? Anyone inspired to make a design of their own? The options are limitless. I’m looking for the perfect plates to make a pretty flower design or graphic print. very sweet! and a perfectly useful gift. Such a cute idea. They came out great! Would you be willing to share the template you made? Thanks so much! Love this idea!! Will use it for my hard-to-shop-for in-laws next Christmas! This is a BRILLIANT idea! Its so hard to find unique hostess gifts…would you share the template? 🙂 Thank you! I discovered the paint pens before Christmas and have been going crazy w/ them. Just finished a scruffy beard mug for a hard to buy for friend. He loved it! I featured those glasses from Furbish in a Hostess post before Christmas….then decided I liked them so much I had to have them too! cute mugs! They are so cute! I’ll have to do something for myself as the mug sets were gifts. Thanks so much for stopping by! holy awesome. i need to make some of these for gifts! and then i will decide that they are just so cute that i will have to keep them for myself. Thanks so much for the inspiration. I had to make on of my own. I can up with a different idea but your design I would love to do next. I love that you made these too!! Thank you for stopping by my blog 🙂 I googled painted steps today and found your blog again! Love it!